Chicken and ribs with pepper crust. The two nine year old girls in the back are my Chinese teachers. 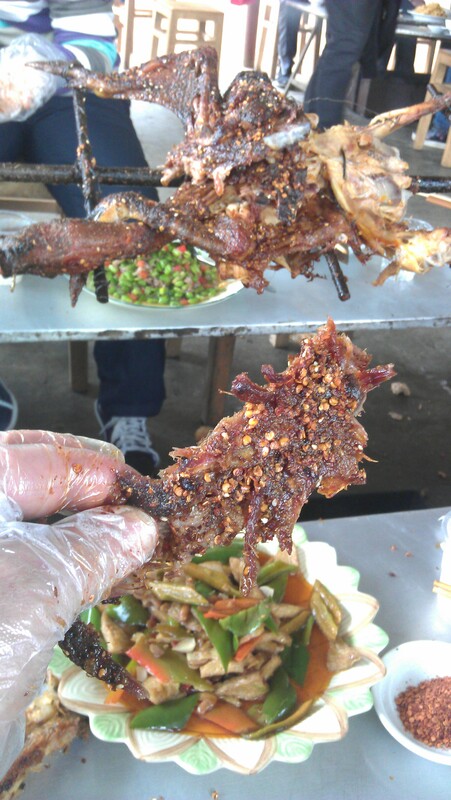 Chicken above and spare ribs below. I went to one of the top night clubs in Guiyang a couple weeks ago, with floor shows, dancers, and women dressed to the max (not exactly Sunday best!). I was with friends but I didn’t know half the people at the table. Everybody wanted my phone number because I was the only foreigner. People were friendly, even some of the men were so friendly, you couldn’t tell really if they were gay. They seemed like friendly “boys”. It was a little uncomfortable. Anyway, a good time was had by all, until I went to the bathroom. On the way back, a beautiful girl just grabbed my arm and wanted to talk to me. She said she wanted to meet me and practice her English. While we were talking, I got her phone number and her friend, a man, returned to the table. He didn’t look happy, and sensing an awkward moment, I immediately said (in Chinese), “Sorry, I don’t want to give you any trouble. I can call you later.” She smiled and said “Keyi” (ok). I returned to my table, finished up with my old and new friends. Then I went home. Imagine my surprise when I got a text message asking if I got home ok. I said no problem, and what about her? Does she still want to learn English? She messaged me back and said she did. I suggested that we get together the next day. I was meeting a friend and two 9 year old girls who were teaching me Chinese. We typically have dinner and then we take a page out of my vocabulary book and practice Chinese. The kids have a great time and learn English while teaching me Chinese. So it was a perfect nonthreatening situation to meet a new girl. We arranged to meet at the university gate at 3pm, and when I got there, no girl. Surprise, surprise . . . So I call the girl to ask where she is, and a man answers. He can’t speak English and I really didn’t want to talk to him. so I said, “What’s happening !” He said they were at the university gate in a car. Great, now I’ve got that sourpuss man from the night before going to my friend’s house for dinner, with the new girl and the two kids, right? So this guy sees me and rolls down his car window. It is one of those guys that I thought might be gay from the night before, and he had a girl with him, not nearly so pretty as the one from the night before. It took a few awkward minutes, with broken Chinese, to figure out that I had the boy’s number in my phone, and the pretty girl really hadn’t sent me a text at all. It was the boy. Anyway, I went to dinner at my friend’s house with the boy, the extra girl, a couple nine year old girls and had a passable, although somewhat disappointing evening. I did learn some Chinese. That’s all. I realized my mistake. I had the two numbers mixed up in my phone, and the boy sent me a text to see if I got home ok. You probably think that I went back that night and retrieved the correct phone number for the pretty girl right? No. No. No, and NO !! !.